Detectives Carrigan and Miller are thrust into a terrifying new world of stalking and obsession when a distressed young woman bursts into the station with a story about her friend being abducted and a man who is threatening to come back and 'claim her next'. Taking them from deep inside a Bayswater hostel, where backpackers and foreign students share dorms and failing dreams, to the emerging threat of online intimidation, hacking, and control, THE INTRUSIONS pursues disturbing contemporary themes and dark psychology. Under scrutiny themselves, and with old foes and enmities re-surfacing, how long will Carrigan and Miller have to find out the truth behind what these two women have been subjected to? If you haven't yet read Stav Sherez, do yourself a favour: go to your favorite bookstore and grab a copy of one of his books today. Even though this is the third in his excellent series starring police detectives Carrigan and Miller, Sherez isn't your standard police procedural series author. He writes literary crime thrillers with a joyfully dark heart, which just happen to involve police investigators. Sherez beautifully entwines style and substance in his crime novels, delivering some heft without disrupting a smooth, page-turning narrative. There's a crackle to his prose, a viewpoint and voice that's a little distinct, and overall is just a pleasure to read (despite creepy subject matter). Technology is all pervasive nowadays - we don't have to worry about George Orwell's idea of an autocracy watching every move of its citizenship - we've pretty much done it to ourselves, by choice. Sherez taps into that reality in THE INTRUSIONS with a criminal who uses technology to stalk and terrorise his victims, remotely taking over their lives. DI Carrigan is facing stark consequences for his past actions: his job, and even his freedom, are in jeopardy. An old nemesis is gleefully looking to drop the guillotine. Meanwhile DS Miller interviews a drugged up backpacker making wild claims. In terms of creepiness, THE INTRUSIONS is at the level of freezing fingers down your spine tale on a pitch-black night when you think you're all alone in an abandoned house, miles from help. Sherez has a real talent for subtly building a fear-drenched atmosphere. Similarly, his tales have plenty of twists and page-turning drive, while never shouting about it. There's a lovely balance - the novel hurtles along but you feel it's a substantial, richly layered story that has plenty to say too. 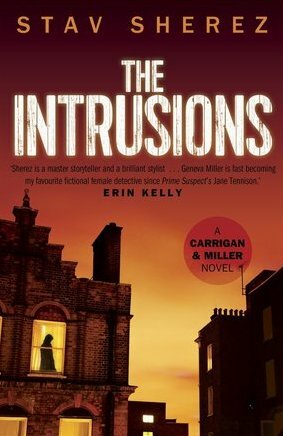 The first two Carrigan and Miller novels were shortlisted for the prestigious Theakston's Crime Novel of the Year Award. Given the excellence of THE INTRUSIONS, I wouldn't be at all surprised if Sherez wowed the judges even more this time around. Very highly recommended.